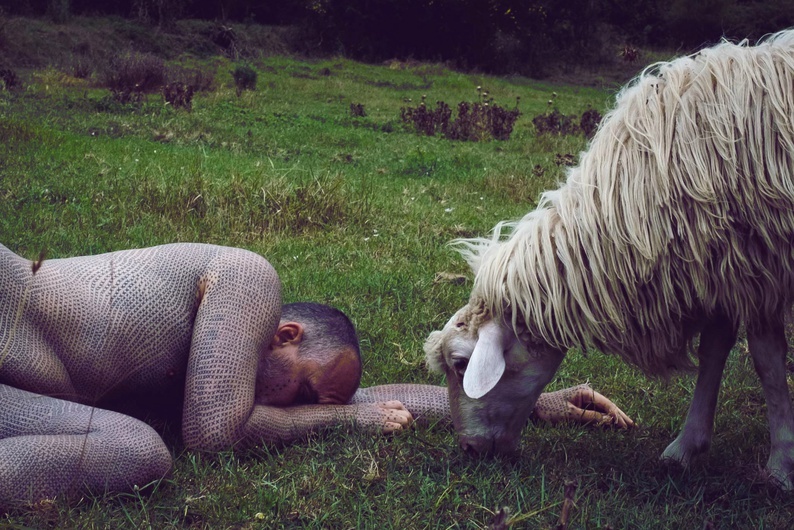 Alfredo Meschi has decided to fight for the liberation of animals by using his own body. Every square inch of it. He’s left his old, "normal" life behind, deciding that the best way to start a debate on the matter was to cover himself in tattoos. The result has to be seen to be believed. "Why do I have 40,000 tattoos? Because 40,000 non-human animals are slaughtered in the world every second, just to satisfy our appetites." These are the simple words Alfredo Meschi uses to explain his position. Born in the Tuscan town of Livorno in 1968, he started his career 30 years ago in the field of information technology, collaborating with big firms like IBM and Siemens. But that wasn't to be his true calling. From then on, his career has revolved around social causes. Nowadays, Meschi is not only a theatre teacher and a writer of books of 'anti-speciesist' rhetoric; he is also an artist. The core of his social engagement is his vegan activism, close to his fight for animal freedom. A cause for which he has chosen to dedicate himself, body and soul, by tattooing 40,000 black crosses onto his own body. Living first as a vegetarian before going full vegan in 2014, he found his passion for animals and nature in an environment completely antithetical to his beliefs: his father was a hunter, who used to bring young Alfredo along during his travels and hunting expeditions in Africa. And it’s here that he developed his interest in the anti-species theory (which states that man has no more rights than any other animal), and his rejection of any form of violence against animals. "We live in a society built on endless, self-inflicted amnesia, says Meschi. "It’s as if our awareness of injustice, compassion, and empathy is a tap that gets turned on an off. At the start of my career in activism I sought a way to resist such amnesia, a way that would remind me of the urgency of the fight every single day. Every single second. And every second, there are no fewer than 40,000 non-human animals killed for our benefit. I wanted to capture that, preserve it forever on my skin - that awareness of that number, every second. I chose the ‘X’ because it’s a 'checkmark', a neutral symbol that we use when we are finished with something, counting something, or killing 'something'." Now, the project has grown into a daily commitment. It has been a long time since Meschi decided to dedicate his life to spreading the word about Project X. It also allows him to meet as many people as possible, and try to raise awareness among other human beings. But raising awareness isn’t the same as convincing someone to copy your actions, something Alfredo is keen to highlight. Project X is based on an exhibition called "Misoteria", which comprises several images of the artist in various states of undress. To further protest against animal testing the tattoos have all been done using vegan ink, and Project X is based entirely on the “gift economy” - meaning that it’s done without any exchange of money for goods or services. For Meschi, "Every human being I meet who sees the tattoos on my neck and my hands in the winter, or my entire body in the summer, is an opportunity. The opportunity to make a new friend, to start a conversation, to tell someone about the urgency of my cause. I expect people to laugh and joke about it, but it’s nothing compared to the interest and genuine attention that my tattoos provoke. "For many years I have been exploring the potential of non-verbal languages, primarily through the Venetian theatre company Teatroimmagine. Like animals, I wanted to use the first form of nonverbal communication and we all possess: our skin. From an artistic and communicative perspective, tattoos were ideal means of express my message." The enormous variety of tattoo artists and styles in the world mean what was once an artform has become a fashion trend and a lucrative business. Covering yourself in permanent ink from head to toe might still seem bizarre in the eyes of many; yet it’s undeniable the commitment that such a choice requires, particularly when the story behind it becomes clear. What’s even more striking is the uniqueness of the repeated symbol, which creates an image that can’t fail to catch the eye. All those crosses that today cover every inch of Alfredo Meschi’s skin become their own language, translating the fight for which Meschi will fight by any means necessary. "Tattoo artists have become increasingly worried that their work is being 'banalised' over the years," Meschi explains. "It’s a problem which has gotten worse as tattoos have become more mainstream. But there are more and more art critics who regard tattoos as one of the primary movements of contemporary art. I believe that apart from the artistic side of it, we should also consider their power as a means of transmitting important political and social messages. I am sure that this will become more prevalent in years to come," he adds. Meschi’s artistic choice perfectly matches his own worldview. It’s a moral stance, an act of awareness, buried in what outwardly looks like a shallow life choice. It’s a declaration that vegetarianism and veganism weren’t born as simple fad diets, and that fighting for such an important cause is a considered choice. On the other hand, it’s not hard to see the increasing tendency to market these choices as a product without focusing on their original meaning. "At the same time as we see the marginalisation of veganism as an ethical choice in favour of veganism as marketing strategy and the 'vegan washing' of factories and corporations, we are also witnessing the emergence of the political dimension of animal liberation. "When people see me or my picutre, they react with great enthusiasm or with ferocious criticism. Yet either way, the important thing is that they pay attention. Starting conversations, asking questions - to me these are all precious opportunities to start a path towards awareness. I’m an anti-speciesist activist 24/7." It’s not about sharing Alfredo’s view, but simply knowing that it exists and it’s important. Seeing is believing. Voglio Vivere Così is a collection of 8 stories that describe unique and alternative lifestyles. A sneak peek into a closed world, one which could not be farther. 8 stories for 8 weeks, chosen by the Cafébabel editorial team.